As the Chinese and foreign cultural exchanges have become more frequent, more and more foreigners come to Shanghai to study abroad, and development, to create broader opportunities for their future. Fish can't walk on the dry land, because the fish can not adapt to the terrestrial environment. So the survival and development in China will be difficult like fish walk on land if you can’t speak Chinese. 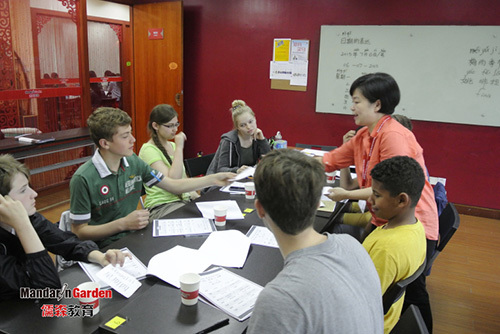 So learn Chinese in Shanghai become an important thing to foreigners. James in the software development industry when it comes to life in China, said: "because I don't know much about Chinese, let my range of activity is restricted, many of the things that are in work and life rely on my Chinese assistant to help me to deal with. After all, not everyone can speak English fluently, and clearly know what I mean. Once I wanted to go to the bookstore to buy a technology book. But I try so hard to describe to the seller, she could not help me find the book." "The most important thing is," James also said, "live in China, is surrounded by a strange language, if not understand will like an outsider, there is a little emotional don't adapt to it, so I want to learn Chinese in Shanghai as soon as possible." To learn Chinese in MandarinGarden, feel the local conditions and customs of China, like and integrate into the life here gradually, let foreigners’ life more funny and colorful.